One of the most continuously evolving vehicles in the Attrell Toyota lineup is coming soon in the form of the 2015 Toyota Camry Toronto ON. Just three short model-years after its previous redesign, Toyota engineers and designers went back to the drawing board. The sedan they came back with has a sleeker look and more athletic stance on the pavement that any Toyota Camry that has come before it. During the process, almost every nut, bolt and body panel was evaluated and replaced. In fact, the only exterior component that remains the same from the previous version is the roof panel. With the radical change in body style came an improvement to the passenger cabin of the 2015 Camry. The overall dimensions of the new Camry remain about the same as the previous version. However, many of the materials used to construct the interior of the vehicle have been improved. Independent reviews of the new Camry have praised the automaker for making the interior more refined with a polished and mature look. Designers went so far as to improve the quality of the material used to make the buttons on the climate and audio controls. Said buttons are also bigger and easier to use. Also new for the 2015 Camry is that every version gets a touchscreen interface to use the popular Entune infotainment system. The five-passenger 2015 Toyota Camry Toronto ON comes in five different grades, or trim levels as they are otherwise known. Toyota starts the trims for the new Camry at LE; and they go up through SE, XSE and XLE versions – as well as a hybrid. Each version of the new Toyota Camry is handsomely outfitted and has an impressive list of standard features that would be the envy of any automaker. The Camry LE comes with 16-inch wheels, automatic headlights, air conditioning, cruise control and an eight-way power mirror. 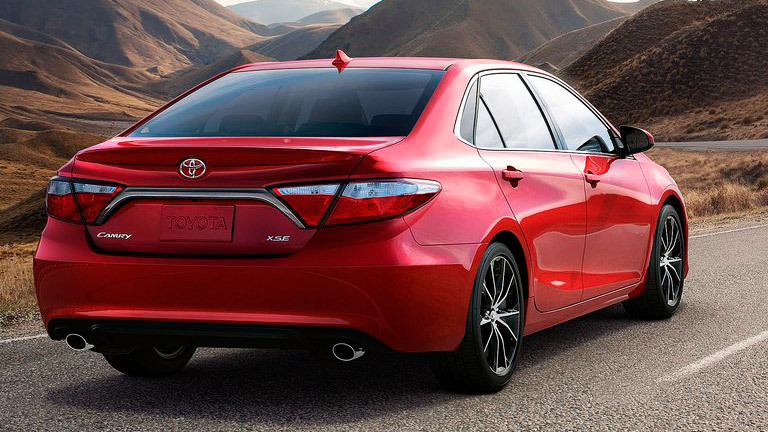 The standard rear-view camera that was made universal for the 2014.5 Camry also returns for the redesigned sedan. Each step up the trim ladder adds new features or further refinement to the Camry. For example, the top two trims XSE and XLE share many items such as LED headlights, a noise-reducing windshield and a sunroof. 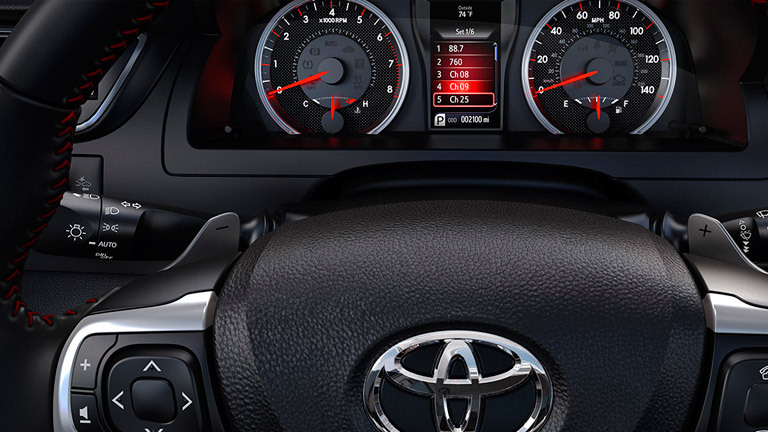 One of the most interesting developments for the 2015 Camry is the addition of wireless cell phone charging capability. Using a compatible phone and battery, drivers and passengers will simply need to lay their phone on the tray to keep it charged.